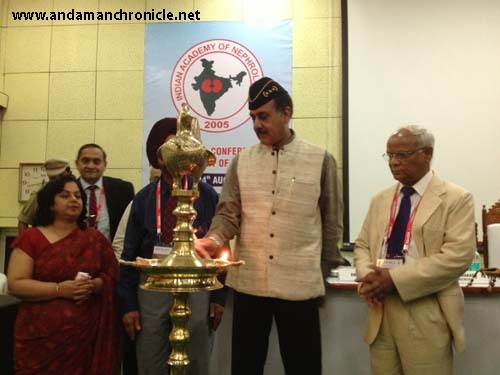 Port Blair, Aug. 22: The 8th Annual Conference of Indian Academy of Nephrology began today at Port Blair with a formal inauguration by the Hon’ble Lt. Governor, Lt. Gen. (Retd) AK Singh today at 6.30 pm at the conference hall of GB Pant Hospital. Around 28 doctors from GB Pant Hospital and INHS, Dhanvantri are attending the conference. The two days deliberation among the top Nephrologists of India is expected to help the delegates from mainland as well as delegates from these Islands to enrich their knowledge in the field of nephrology, especially the recent advances. Speaking on the occasion, the Lt. Governor, Lt. Gen. (Retd.) AK Singh congratulated the organisers for arranging the conference in the islands. He said, while the islands are of great strategic importance and security value, there are great amount of challenges and possibilities that exists. Spelling out the challenges, the LG said that Education and Health are the two major challenges that the islands face. Apart from these there are issues like lack of land, opportunities, connectivity in both land and sea, connectivity of voice & data etc. he said, assuring that slowly and steadily we will meet the aspirations of the people. The LG further explained that we have a good hospital but we lack specialists. We have medical facilities spread out to 150 Kms from North to South but there is shortage of doctors, specialists and we do not have any super specialists. Therefore for any important treatment, most of the times patients are referred to the mainland and that puts an additional burden of cost of travel, cost of stay and cost of treatment, especially for the people who are at the poverty level. But we are looking forward; he said pointing that the Principal Secretary, Chief Secretary and their team have their task cut out to ensure best health care facilities for the people. The Lt. Governor took this opportunity to request the doctors present in the conference to encourage their colleagues to spend at least few months in the islands for the patients. In this way we would be able to meet the aspirations of the people better, he said. On the request placed in the social media, the LG had also called up the Director of Health Services to request the visiting doctors to spare some time for the patients. He said, “I am happy that two of you have agreed to see the patients, which would raise the moral of the people and we can see a ‘connect’ with the conference happening here”. “We are also in the process of establishment of medical college in the islands. Hopefully we would see the establishment of the first medical college with GB Pant Hospital as its nodal agency in the coming year”, he announced stating that he has promised the islanders that he would do his best to meet the aspirations. Turning his attention towards other areas like tourism, the LG said “It is a conscious decision to keep these islands in its present form by the Govt. of India and I am proud to say that we have a chain of almost 94% forest and de-forest cover in these islands, the credit of which goes to the Centre, Administration and the islanders. But this also poses a lot of dilemmas and challenges for us in many fields”, he explains. Everything that we get comes from the mainland. Large amount of resources have to be pumped into these islands. We are focussing very keenly on tourism. While we encourage tourism, it is also our endeavour to ensure we maintain what is there in its natural form. Therefore our motto is development, keeping Tribal Concerns and Ecology to the fore, the LG added. At the outset Dr. D.S. Ray, Organising Secretary welcomed the gathering, while Dr. SC Dash read out the presidential address. On the occasion, Padmashree Dr. KS Chugh was honoured by the Lt. Governor soon after which the Chief Secretary, Shri Anand Prakash released a souvenir of IANCON 2013. The vote of thanks was presented by Dr. Shiv Shankar Singh, Joint Organising Secretary, IANCON.